This update allows you to msfencode a msfpayload into an existing executable and the new executable still function like the original. So if you inject into calc.exe you get calc.exe and your backdoor. Let's make our new backdoored executable. Get the backdoored exe on the other box and execute it. 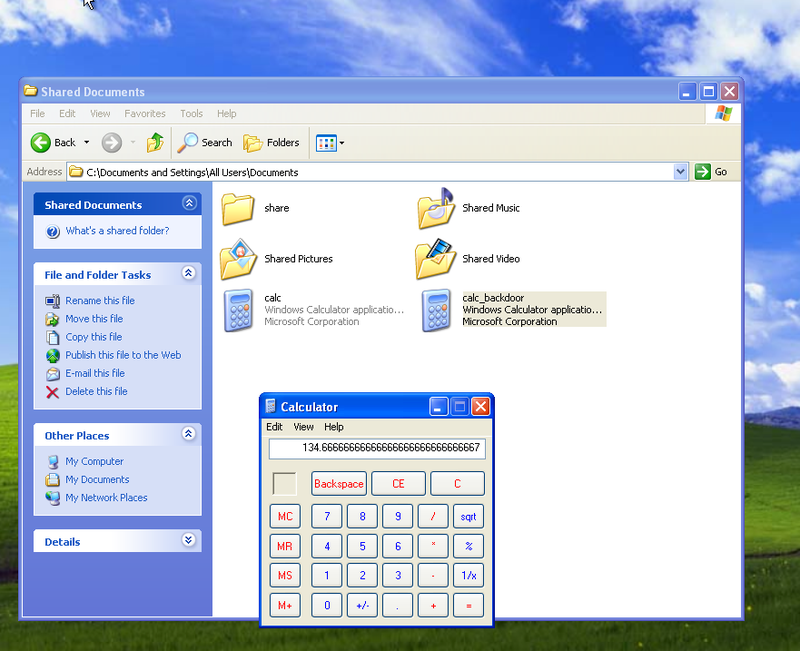 We have a functional calc.exe and our shell. Keep in mind that you'll still need to migrate away from the backdoored executable process because if they close the exe you lose your shell. This blog has been inactive for about a month but it has nothing to do w/ a standstill on my part. I will post something useful relatively soon but please know I am co-authoring another AppSec specific tool and this takes up the majority of my time. Foursquare is pretty neat. 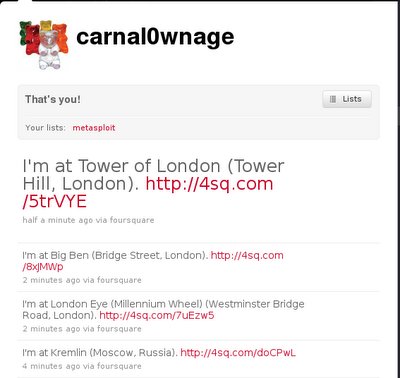 You can post you location via phone or browser and get nifty badges for different things or become a mayor of a place if you check in to that location the most. Its also exceedingly easy to cheat at. I only casually mentioned the idea of cheating to @Jack_Mannino and within a few minutes of emailing him the link to the API he was already traveling the globe at record speed. The simplest thing you can do is checkin and post your location by vid or venue. private - (optional). "1" means "don't show your friends". "0" means "show everyone"
twitter - (optional, defaults to the user's setting). "1" means "send to Twitter". "0" means "don't send to Twitter"
facebook - (optional, defaults to the user's setting). "1" means "send to Facebook". "0" means "don't send to Facebook"
It being a POST you'll have to write some code to handle the Content-Length or use Burp Repeater or Metasploit. Have fun traveling the globe from your living room.